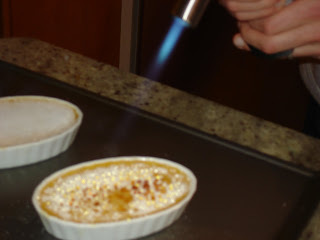 When I purchased my creme brulee torch and made my first post on basic (but delicious) creme brulee, I stuck to the recipe that came with my Bonjour Creme Brule torch. I still advise you to take a look a tthat earlier post for general instructions and safety issues for making creme brulee. However, I am now officially expanding into the unchartered world of flavored creme brulees (dark chocolate creme brulee coming soon!). 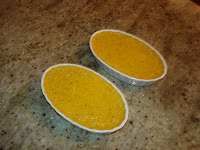 For today's post, I prepared spiced pumpkin creme brulee with my husband last night. This is just as easy to prepare as regular creme brulee, but is an interesting twist on the traditional dessert. The end result was a bit more flan like than a traditional creme brulee, and has the essence of pumpkin pie, but with the traditional creme brulee crisp surface. My husband and I agreed that this was a great take on a classic dessert. The following recipe makes four creme brulee desserts in traditional creme brulee ramekins, but can easily be doubled to make more for a party. And yes, this is the quintessential party dessert. The first step is to arrange the 4 ramekins in a large metal baking pan (I always use a roasting pan). In a medium saucepan, combine the 1/4 cup of sugar with the heavy cream and bring to a simmer on medium high heat, just to dissolve the sugar. Then, take off the heat. In a bowl, whish the egg yolk and the hot cream mixture until well combined. Then add the spices, vanilla and pumpkin puree and whisk well to combine. Then strain and divide the preparation among the ramekins. Add enough hot water to the roasting pan to come up about a third of the way of each ramekin. Bake at 325 F for about 45 minutes, until the custards are stiff. Then, chill in your refridgerator for about two hours. 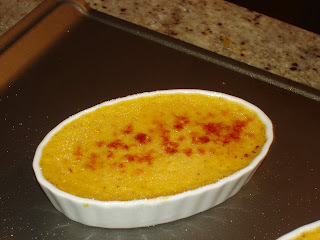 Follow the directions from my previous post with respect to adding sugar to the top and torching the creme brulees. Creme brulee might now be one of my favorite desserts to make, as my friend in San Diego warned that it would be as soon as I tried it the first time. I think, though, that one of the reasons that I like making it is that it is very sciency. Baking in general is pretty scientific, and cooking can often be as well. So the inner scientist in me loves projects like this that involve a bit of kitchen chemistry (I was a biology major at Haverford College, and studied molecular/cellular biology and biochemistry, and apparently this is how I prefer to put all that biology lab experience to use). The bigger the experiement, the more interested I become (which is why making my own cheese is coming soon!) I suppose this is a pretty good combination of my two passions in those college days - science and writing. What a fun twist on creme brulee!